It's Nancy Nickel here today, with a new Tutti Designs share! now is the time to be thinking about making those cards. you really must go take a look at the November Release section. 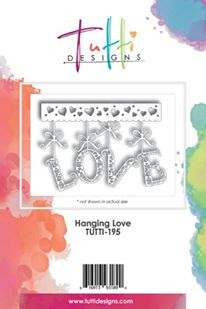 It's filled with amazing dies to create cards for those you love! For my card today, I used the wonderful "Hanging Love" die. It's another one of the fabulous Tutti Designs that makes a beautiful card very quickly and easily. I simply chose some pretty papers that were coordinating. and used another one to cut the lovely die. I then cut two decorative strips from an additional coordinating paper. and a second wider one was added to the bottom. Here's a closer look at just the cut. One bonus of this particular die is that it also cuts out all those wonderful little hearts. I didn't need them for this project but will certainly use them on another one. Papers: Recollections - Cardstock, Prima - Madeline Collection. OMG ... this is just FANTASTIC Nancy! Love your design around this beautiful die cut! Well done! All we need is 'Love'! Happy Birthday with Stitched Rectangles. You are a star, Tutti style. With Love and Stitched Nesting Rectangles.